GoodRx Gold ™ Pharmacy Discount Card - Our Best Savings! GoodRx Gold is the easiest way to unlock big savings on your family's prescriptions. Save on more than 1,000 drugs, with many less than a typical insurance co-pay. GoodRx Gold is a monthly membership program that provides dramatic discounts on prescription drugs and healthcare services for you and your family. For $5.99/month, GoodRx Gold membership provides exclusive access to low drug prices for individuals. For families, choose our $9.99/month plan and add up to 5 family members — your kids, grandma and grandpa, and even pets! It's so easy to save. Just show your card (or the GoodRx Gold mobile app) when you fill a prescription at thousands of participating pharmacies in the United States. Over 1,000 prescriptions for under $10 with GoodRx Gold. That's a savings of up to 90%. GoodRx Gold prices can even be lower than your insurance copay. Need a prescription but can't get an appointment with your doctor? GoodRx Gold members get online physician consultations for $10. Learn more in just 30 seconds! Where can you use GoodRx Gold? GoodRx Gold does not provide savings at Publix, Sam's Club, Walgreens or Walmart. Find GoodRx Gold pharmacies near you. How much can you save with GoodRx Gold? Do you or your family take 2 or more prescriptions per month? If so, GoodRx Gold can likely save you a lot of money (even if you have insurance). GoodRx Gold members save an average of $70 per prescription. Which pharmacies accept GoodRx Gold? GoodRx has negotiated incredible discounts with thousands of pharmacies across the U.S., including major pharmacy chains like CVS Pharmacy, Target, Kroger, Safeway, Vons, Albertsons, Ralphs and many more. 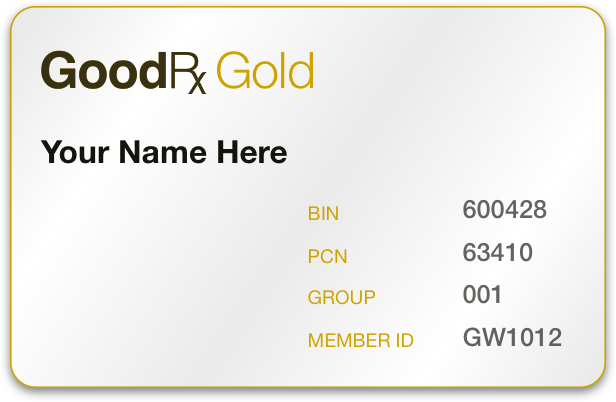 Just present your GoodRx Gold card at any participating pharmacy. How much is a GoodRx Gold membership? GoodRx Gold is free for 30 days, after which you'll pay $5.99 per month for individuals. For families, choose our $9.99 per month and add up to 5 family members, including pets. GoodRx Gold is an excellent way to save for any family that takes multiple prescriptions. Remember, you can cancel anytime. GoodRx Gold prescriptions are deeply discounted prices that are up to 90%* off of the pharmacy's cash price. You'll find the maximum savings on generic prescriptions (which make up more than 85% of the prescriptions Americans take). Already use GoodRx? You're likely to save almost 50% more with a GoodRx Gold membership. Find prices for your prescription. Can I use GoodRx Gold with my insurance? You cannot combine GoodRx Gold with insurance or Medicare. However, GoodRx Gold prices are so low that they may beat your co-pay — especially if you have a high deductible plan. Best of all, there are no forms, paperwork, formularies or limits with GoodRx Gold. Learn more. Ready to start saving with GoodRx Gold? Sign up for a free 30-day trial now, and you'll get instant access to your GoodRx Gold savings card (you'll get one in the mail, too).